I have said it multiple times by now, I like the retelling of fairy tales. Cinder by Marissa Meyer is one of the very best in my opinion. I hope I can convey what I like about this book. 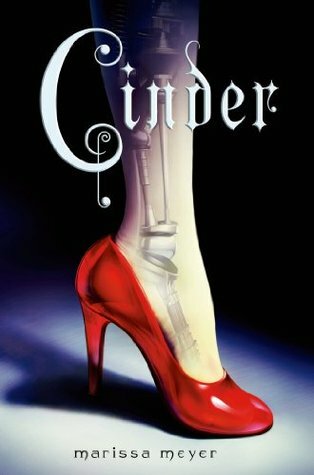 Cinder by Marissa Meyer is the retelling of Cinderella, in a city that sounds to be in some future. New Beijing sounds beautiful and disgusting all at the same time. A city full of dirt, filth and buildings so close to each other it is almost inhuman., but also full of strange and interesting characters and culture (also I would like to see the view from the palace/research center windows, Marissa Meyer describes it as breathtaking). Cinder – Cinderella – is an interesting cyborg. She is friends with her younger sister Peony and the house robot Iko. She has no memories about the first eleven years of her life, when she was adopted. But she accepts it, getting only curious when dr. Erland comes up with some interesting facts about her. She does her best to resist being the Cinderella of the family, but not at the cost of others. Iko – the mice – is the household android with a very rare personality. She is quirky and happy. And most of the times she sounds as if she was a real girl and not an android. I think is well written by Marissa. Prince Kaito – the prince – The his father is the better ruler, but he makes a fine ruler too. He is caring for his country and worries for his people. On top of that there is also the plague that is slowly killing the people of earth. After his fathers death he takes over the rains and tries to do his best to rule the empire, but Queen Levana makes it him very hard. I really like dr. Erland, he is funny, but does know what he is doing. I could almost imagine his accent while I was reading and in the audio book it is also done with one. The Lunar Queen, Levana, really creeps me out all the while reading. She sounds like a disgusting woman. She is manipulative and revolting, with her false empathy. She is a well done bad guy/woman. There was only one small thing I had a problem with. It is never told why people are so against cyborgs, is it just fear or prejudice? It is something I am against. Through out the book there is a destinct problem against cyborgs (her stepmother, the breadvender a.o. ), but it is never really explained. Cyborgs are being tested on to find a cure for the plague. I really liked this book and loved reading it again. The next book I will read is Scarlet, the second book in the Lunar Chronicles. Last time I finished Cress, since Winter is now out, I will read the whole series. Looking forward to it! This entry was posted in Book Review and tagged Adventure, Book Review, Drama, Fantasy, Marissa Meyer, Romance, Science-Fiction. Bookmark the permalink.